​Begin a new relationship with your food by adopting the Five Guidelines to Healthy Eating. Enjoy your FREE copy here. Is anxiety and stress affecting your food choices, your creativity and your sleep? Living a balanced life requires conscious choices on a daily basis to set up optimum health, harmony and peace of mind. The starting place is different for all of us. Blissful Living is a step by step program of care that will allow you to more fully live a life of balance, joy and freedom. 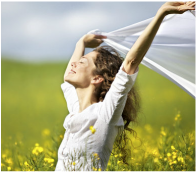 Take YOUR Next Step To Radiant Health and Wholeness with a FREE 30 minute consultation.